and Mrs. Helena Kpatata the Head Mistress of the School. occupying key positions in the country. 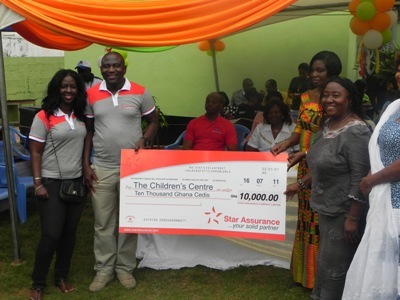 Presenting the amount, Miss Panin Duffuor, The Executive Director of Star Assurance, indicated she was excited to be a part of what was happening as she recounted fond memories of the time she schooled at the Centre. education. Star Assurance believes that every child has the potential to become a great person. However, challenges of life sometimes make it difficult for very intelligent people to even complete basic education. “We are giving this seed money with the aim of helping any child at the Centre whose education may be threatened by a misfortune’’. Apart from paying claims and earning an enviable rating from International Global Rating of South Africa and paying taxes to the Government of Ghana, Star Assurance sees Corporate Social Responsibility as a way of directly supporting the needy and vulnerable in society.